Underneath the impressive Olympus, the home of God's, spreads out the picturesque Litochoro. A picturesque town, built in the Enipea River Gorge. It combines wonderfully mountain and sea and it is a remarkable choice for all seasons. It offers to a visitor a rich natural landscape with many gastronomic options. Try traditional sweets and buy Olympus herbs. See some of the attractions of Litohoro. In the center of the village is the church of Agios Dimitrios. 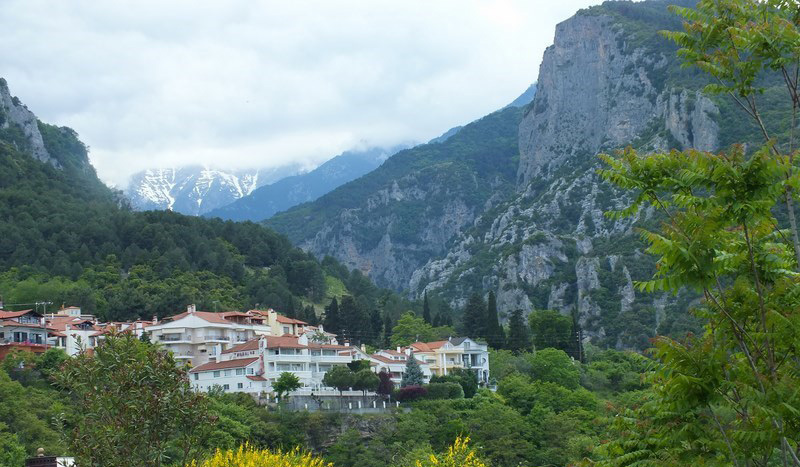 After visiting the Maritime Museum and taking a taste of the local naval tradition, it is worthwhile to walk to the Enipea Gorge, the path which begins next to the tavern “Mili” and after an easy ten-minute hike, it ends at ” Vithos “. The trail from that point continues to arrive after about eight kilometers in Prionia, where climbers start their ascents. The waterfalls of Enipea meet approximately midway, a few minutes after the monastery of Agios Dionysios (open to the public from spring to autumn, depending on the weather), and twenty minutes later we meet the Saint Cave where the monastery Saint Dionysios. At the entrance of the village, there is the Katounia Park, which in winter is suitable for photos with a background of snow-capped pine trees. Visit the picturesque chapel of Agia Paraskevi on the top of the village after the beautiful grove of Agioi Apostoloi. Even higher, you will find Prophet Elias, built on the hill. From there you will have a panoramic view of the village but also of the wider area of the plain of Plaka to the castle of Platamonas. Three kilometers southwest of Litochoro is the impressive fir forest of Agios Ioannis, while in a clearing of the forest you will see the church of Agios Ioannis Theologos. The picturesque village of Litohoro has a lot of fun. Graphic cafes and restaurants for every mood can be found both on the main street and the area ‘Lakos’next to the stream with many events holding during the summer.